FabLabNet Library is an open online document repository that collects key deliverables of public interest – inlcluding mapping studies, videos & tutorials – jointly developed and piloted by nine FablLabs in the context of the Interreg Central Europe FabLabNet project. Fablabs are technical prototyping platforms for innovation and invention inviting the society at large to become innovators. The project joins 9 fablabs into a central European Network to share experiences and develop activities to boost their knowledge and capacity. Museums of all sizes, with collections ranging from fine art to social history, are changing lives – often in partnership with community groups, health charities and other third sector organisations. The British Museums Association is campaigning for museums to develop their role as socially purposeful organisations and has released a compelling report on the social impact of museums. A great collection of activities to help create learning environments which meet every child’s social and emotional needs. Ashoka, the leading association for social entrepreneurs has identified empathy as a key skill of the 21th century. This toolkit was launched as part of their campaing Empathy Now!. A NEMO publication dedicated to Europe’s most prestegious museum awards. Learn more about their aims and gather valuable information on their judging criteria and application processes. Spoiler alert: Our very own Children in Museums Award is featured too! Our friends from Ecsite invited us to hold a Hands On! session at this year’s edition of their annual conference. From 7-9 June 2018 more than 1000 participants gathered at Europe’s largest Science communication conference. In our session ‘Reconceiling creative exhibit design and the demands of today’s compensation culture’ we explored the obstacles curators and exhibit developers face throughout their work. This report features summaries of the three inspiring brave practice presentations, questions and issues raised by the participants and a list of reads recommended by the speakers. 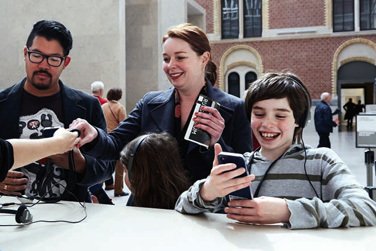 This Nemo publication written by CMA-judge Margherita Sani explores why there are so many extraordinary museum projects dedicated to young visitors in the Netherlands. Learn what makes the Dutch museum landscape so unique, dive into an inspiring case study and discover the work of 22 best practise projects. Hypatia, a EU-funded project aiming to develop a theoretical framework on gender inclusive STEM education created this collection of activities for teenagers aged 13-18 years. This online resource contains workshops, speed dating, card games, debate scenarios and plays drawn from good practices across Europe. Play Safety Forum has gathered three leading experts of the fields of play and risk to introduce a state-of-the-art approach on risk management. The result is the risk-benefit assessment, taking into account latest scientific findings on human play. This guide shows, how insitutitons can successfully balance safety and free play. This resource list complements the article “Keeping Visitors Safe Around Exhibits,” by Kathy Krafft and Harry White, which appeared in the January/February 2014 issue of Dimensions magazine, published by the Association of Science-Technology Centers . It features lists of recommended safety products, links to safety resources, recommended reads, sample accident forms and risk assessments. Evaluating the social impact of a museum can be a real challenge. This toolkit by the UK Museums Association looks at a variety of approaches including qualitative and quantitative techniques, helping institutions to find the best method for their needs. Museum professionals from all over the world share their personal answers to the question ‘What will museums be like in the future ?’. Get inspired by the thoughts and ideas of colleagues, or submit your own short essay and participate in this visionary ongoing project. Do not miss out on browsing through other articles of the Museum ID Magazine as well – it is definitely worth it! A research compilation on the major types of play and its related learning benefits by Rachel White of the Minnesota Children’s Museum. This toolkit by the ENCATC network on internet engagement data, marketing and storytelling strategies, assists cultural insitutions to make more of their social media appearances. It also provides valuable background information on the nature of social media and best pratice ideas to boost the benefits of social media activities for your organization. Raluca Bem Neamu’s (president of the Da´DeCe (I Wonder Why) association) personal report on the 11th Hands On! conference titled `Future in children’s Hands – informal education as a tool for social change`. Our 2017 travelling conference brought 300 dedicated museum professionals to Pilsen, Pisek and Prague. See our biennial gathering through the eyes of a first-time participant and benefit from her take-aways. The open access online version of Nina Simon’s best-selling guide to working with community members and visitors to make cultural institutions more dynamic, relevant and essential places. The summary of the discussions and outcomes of a planning Meeting initiated by the US- National Academy of Sciences. Leaders of different diciplines were asked to discuss the future challenges, opportunities and developments of museums and libraries. Dive into their ideas and visions for 9 key themes of the field and gain new insights with the help of the recommended literature.